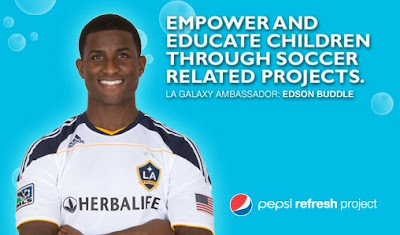 Only a few hours remain for you to vote for the LA Galaxy and Edson Buddle's Pepsi Refresh Project and help the club win a $50,000 Pepsi Refresh grant! The Galaxy's project will look to refresh communities by empowering, encouraging and educating children through the building of a soccer-themed playroom at a local children's hospital and conducting soccer camps focused on fitness and health in the LA area. In addition, the club will look to provide aid, equipment and soccer instruction in Haiti for kids affected by January's earthquake through the Galaxy Foundation's Haitian Initiative. Don't miss your chance to help Edson and the Galaxy give back to community! Fans can cast their vote up to 25 times per day at www.MLSsoccer.com/PepsiRefresh/LA for the Galaxy until tonight at 8:59 p.m.